Go back to school for a day with legendary British angler Charles Jardine at the Pasadena Clubhouse. For thirty years Charles has been educating and entertaining students with his blend of wit and wisdom. 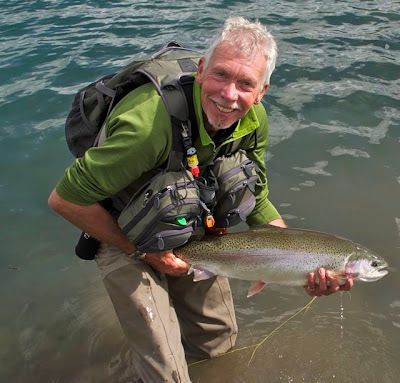 Charles has received the highest awards our sport has to offer and enjoys worldwide recognition as a fly fisherman, master fly tier, FFF Master casting instructor, author, artist, chef and teacher. He was a streams of England. He leads groups as far afield as the Bahamas, Cuba and the Seychelles. He is equally at home on the big Western waters of Idaho and Montana as the saltwater flats of Belize. He has recently joined the G Loomis Pro Staff in the UK. The seminar will include instruction in presentation casts, tying and fishing of soft hackle flies and special leader construction. There will also be time for individual instruction on casting, tying or general fly fishing questions. Charles brings to the table a vast knowledge of European techniques that will improve your chances on our local waters. For this who wish to focus on casting instruction, FFF Certified Casting Instructor Marshall Bissett will be on hand to help out those more interested in casting than tying. Equipment: Any rod/reel combo you wish to learn on. Vice, tools and materials if you want special tying instruction. Hat, sunglasses, sunscreen and other angling essentials. Notebook – analog or digital. Lunch and soft drinks will be provided. Class Fee: $100 Call (818) 785-7306 with any questions. Good ol’ Piru Creek. Get bit, on flies and by no-see-ums. Itchy, itchy. High water and snow pack in Sierra will probably keep Pyramid dam releasing a good rate through summer. This is a good thing after many dry years. And as most fishers who keep an eye on water matters know, the West is still packed with snow (wet snow), packs are far above normal and temps have remained cool. Runoffs may become scary if not downright dangerous this summer in several areas -- what? Runoff in summer? Skiing on the 4th? True. Piru fishes excellently at the moment, but take your repellent. Biting Diptera, black flies, no-see-ums the little bastards, whatever you choose to call ‘em are active and looking for your ears and elbows. Knuckles too, where I took itchy bites that took two weeks to calm. And I used spray. Must have been the releasing of fish that rinsed my protection away. Shorts not recommended, too many biters and poison oak (bumper crop this year). Piru Creek is an excellent place to learn our sport. You use a variety of casting techniques, from rolls and sidearms in hemmed-in spots, to classic dry fly heaves on long flats that look like the typical western spring creek. The first trout below came up for a #18 CDC & elk on a 50’ cast upstream. Just for fun. Felt great to cast that far just 45 minutes from Fishermen’s Spot. Hydropscyhe caddis – the house-building net makers – are present, and lots of Baetis nymphs, many ready to pop. Guys at the Spot will direct you to PT nymphs and caddis larva (who drift and who make easy targets for trout). #18 in tan and lt. olive on the caddis, #18 on the Baetis, fish both with an indicator set shallow as takes are quick and sure in the shallow waters of the creek. 2’ will work. Caddis dries and emergers, and small mayfly patterns will also take fish on ol’ Piru. The fish don’t seem to get picky until Trikes fall, or at dusk when caddis emerge or spinners fall. Then they act like real trout. Piru has caddis. The one loose fellow on the rock (last shot) appears to be a Rhyac, the free-roamer, but it’s a net-spinning Hydro who seems to have been interrupted by me when building his house. Three dark head segments ID the Hydro versus two on our Rhyacs. Piru has the baetis, and in many colors. Several here will be popping soon if not already spawned-out and eaten by trout. One memorable day Spot regular Marcelo Tubert and I fished an overcast day. This was in neoprene days and I said, Hey look, they’re walking down your thighs. Baetis females had landed on Marcelo and were walking south on his waders, entering the surface to lay eggs. We looked and there were egg masses on the neoprene. They may be of many colors and ages, but the #18 PT nymph will work fine. Scuds are found in Piru too. Larger fish don’t appear till late. But even the small rainbows at Piru will be well-formed, colorful things. And leapers. Very fun to catch. Take your repellent, parking pass, water and a small box of patterns. No need for the whole Scout outfit here, mobile is best.